Islamic rural castles differ from Christian ones, not only in their form of construction (see below), but also in the social model they represent. The basic organization of the rural population was the castle and farmstead unit (hisn /qarya complex). 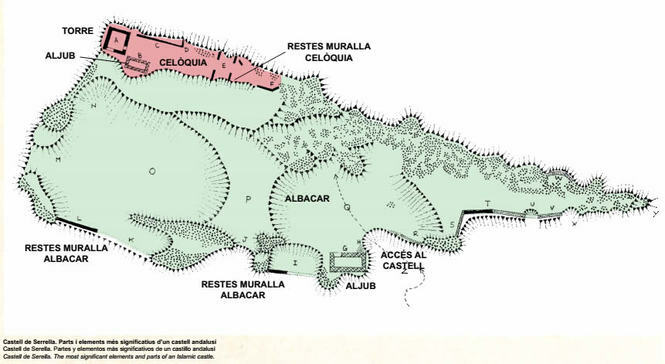 Each castle had a number of farmsteads (alquerias) associated with it which created a kind of district, hisn, bearing the same name as the fortification: 'the space where people take refuge in case of danger." Islamic society, unlike Christian society at the time, was not dominated by feudal relationships or vassalage. It was organized around the aljama, a sort of council of elders which governed the community and collected taxes. The structures of all the castles follow a basic pattern. 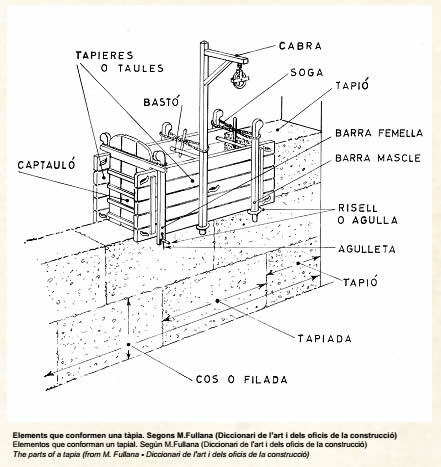 They consist of a small area called the celoquia at the highest point containing a building where the caid (who was in charge of the fortification) resided and a water cistern (aljub/aljibe). Below and around this, there is a wider enclosure called the albacar which served to shelter the population and herds. Small dwellings built to accommodate a refugee population can be found in this area, and there is usually another water cistern. The castle would also be responsible for defensive structures such as farmhouse towers in major population centres and remote villages. ramming it in layers, sometimes they added chunks of limestone. When the mixture had hardened, the planks were removed and relocated to make another form-work box. 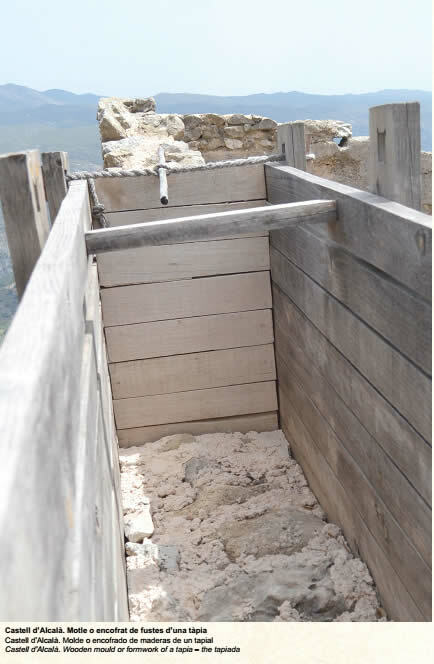 The traces left by the boards and putlogs can be seen in the finished work, and survive to this day in many castles. 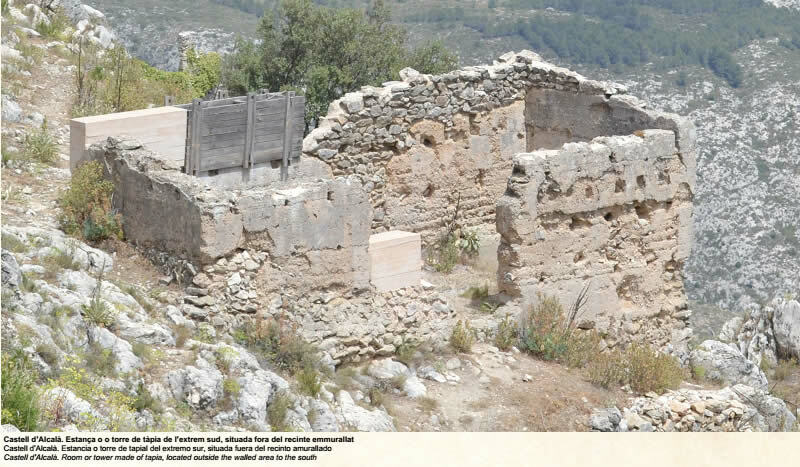 ﻿Once the Valencian mountains had been pacified after the Muslim revolt of 1276 - 1277, the feudal Christian powers had to decide what to do with so many Islamic fortifications. Keeping them all would imply an enormous cost. In addition there was the danger that they might return to Muslim hands. They therefore chose to keep the most important ones and to dismantle the rest. The Christianised castle then assumed the role of feudal control with the construction of the most important element i.e. 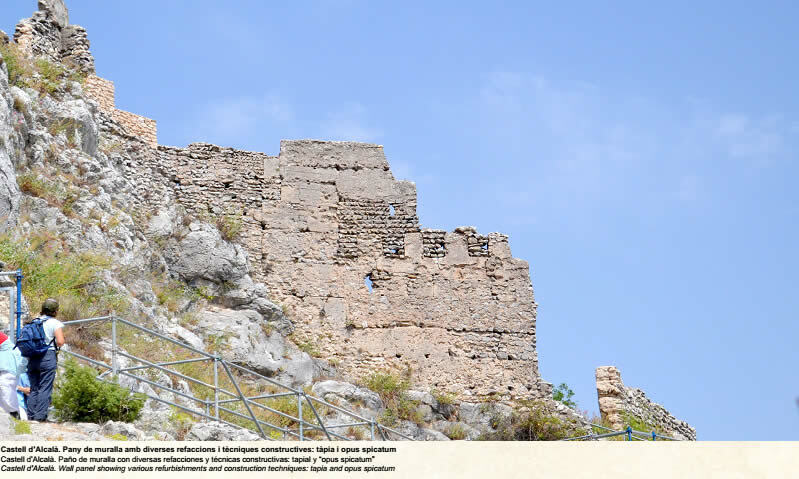 the Castle keep (Torre de homenage) which was built in a prominent position.